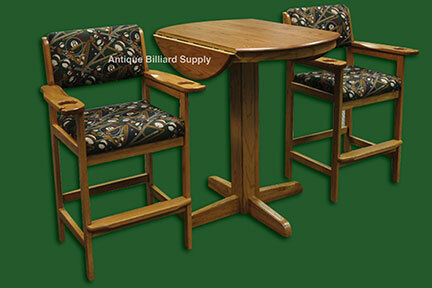 #7-09 Pool table spectator chairs and matching table of solid oak construction. Round table top folds down at each side (as shown) to fit in minimum space. Medium brown finish. Stain-resistant fabric features pool room scenes on a dark green background. Available as a set or as individual pieces.